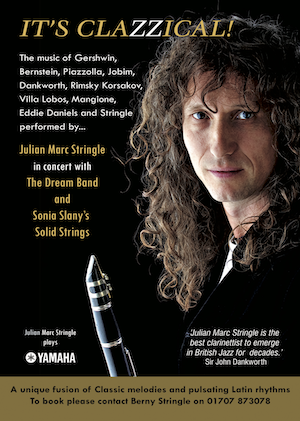 Julian Marc Stringle - Clarinet, Neil Angilley - Keyboards, Dominic Ashworth - Guitar, Chris Dodd - Bass, Mike Bradley - Drums, Marc Cecil - Percussion, Sonia Slany - Violin, Jonathon Truscott - Violin, Steve Tees - Viola and Nick Cooper - Cello. This concert to launch the 'itsclazzical' album will take place in the Rayne Theatre at the Chicken Shed. The cross-genre fusion of classic melodies and pulsating Latin Rhythms features stunning arrangements of works by Bernstein & Sondheim, Piazzolla, Villa Lobos, Jobim, Dankworth, Mangione, Hubble, Lennon & Mc Cartney Stratta and Stringle. Dont' miss this joyous celebration of the Clarinet ! This event is seated but if you would like to reserve a table and dine at the venue on the night, please call Brothers Grill on 020 8440 2221 and book your place (subject to availability).